One. It’s the number of stars in the Texas flag. It’s the number of U.S. Presidents who have conducted the OU-Texas pre-game coin toss. And it’s the number of shirts lost by Texas Laundry in the last six months. For a business that handles upwards of 1,000 garments per day, the statistic is unbelievable. “Quality and service, that’s what you have to offer if you want to keep your customers,” says David Jarvis as he jumps out of the service van and begins the tour for us. Jarvis owns the Sherman business with his brother John, his dad Tom, and his mother Jerri. Step inside the store, and you are in the midst of 21st century high tech. In the last 12 months, the Jarvis family has spent nearly a quarter million dollars to modernize the business—refinished floors, bright lights, and modern counters to support computer terminals and scanners. Long-time employee Frances Barnhardt (How long? Jarvis claims she “came with the business.”) is no longer the “counter girl.” High tech proficiency has elevated her to sales representative. There are no more handwritten tickets, safety pins or laundry markers; Texas Laundry customers and clothes now get barcodes. On a first visit, garments receive a teeny tiny (tic-tac size) barcode steam pressed onto an inconspicuous location. Once it’s attached, your clothes will always be associated with you in the computer system. Barcodes are the key to a high-tech journey that leads your garment safely back to you. Two new washers each spit out 60 pounds of clean laundry with every cycle. Shirts make their way to the Sankosha, a machine that demands to be called by its brand name because of the way it presses a shirt in one motion— perfect every time. Pants go to the topper where a laser aligns the crease. Double creased pants are a thing of the past. All machines are arranged for efficiency, and an overhead screw drive moves items quietly to their stations. At the end of the line, the true genius of the operation materializes. A rotating rack helps the operator sort finished clothes for bagging. 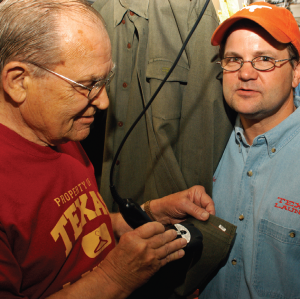 Barcodes are scanned and hangers assigned to a numbered station. The computer assigns all garments on the customer ticket to the same location. Plop a hanger into the wrong station and the computer gives a warning. “It just won’t let you put them in the wrong place,” said Jarvis. 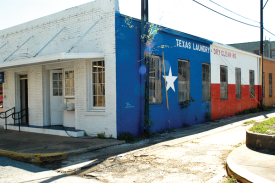 Computerization is just part of the process to make Texas Laundry more competitive. The Jarvis family says they are committed to going “green,” using more environmentally efficient products and processes. “To the best of my knowledge, we are the first dry cleaning operation between Dallas and Oklahoma City that has eliminated tetrachloroethylene, more commonly referred to as perchlorethylene or PERC,” David says proudly. PERC is responsible for that solvent smell on your dry-cleaned clothes (and then on your body) and it can cause headaches, nausea, and cancer. Jarvis says the chemicals (except for some minor spot use) have been replaced with “wet cleaning” technology. Wet cleaning uses specially formulated soaps and spotting agents, (consisting of enzymes, peptides, synthetic polymers, and anionic and nonionic tensides). As for the single lost shirt, Jarvis still has hope that it will turn up somewhere. He hates to disappoint a customer, even one. With hot water, steam and presses, the laundry business is notoriously hot work. But with hot technology, steam sealed barcodes and impressive customer care, you have to agree that Texas Laundry couldn’t be any cooler. How would you like for the success or failure of one year’s worth of work to hinge on one week? That’s practically the job description for 63-year-old Jerry Duvall, CEO of CIS Conferences Inc. “My friends harass me about working one week a year, and that’s basically true, but it’s a very hard and intense week,” Duvall said.